Savory, full of flavor, and super easy to prepare, this Slow Cooker Beef Tip recipe is naturally gluten-free, dairy-free, and Paleo friendly. 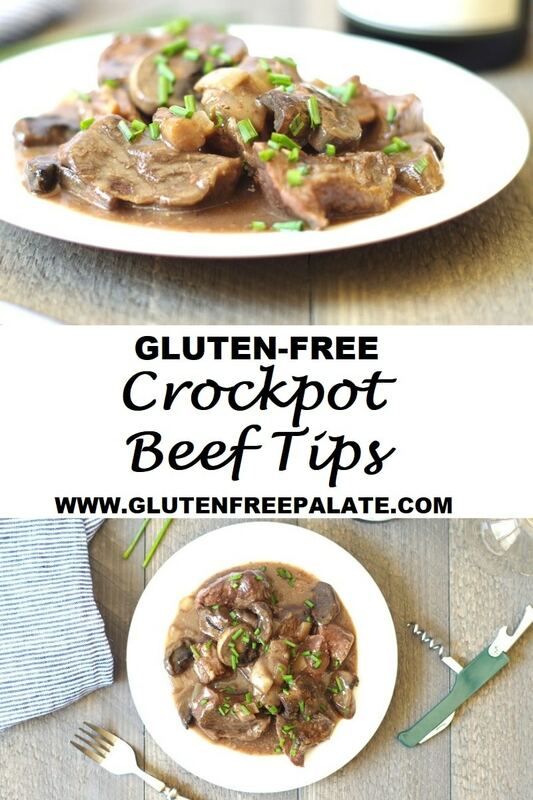 You are going to love these crock pot beef tips! It’s been snow-mayhem across the country and we’re practically snowed in. I say practically because our city is shut down for the most part and so many places are closed. It’s funny that we shut down after 10 inches of snow when the East Coast wouldn’t even blink at it. We couldn’t go anywhere with all the snow, ice, and cars piled up on the road. I honestly have NEVER made sirloin tips and it was the last package of meat we had in the house. But now that I know how easy these crock pot beef tips are to make, I am hooked. I also have Instant Pot Beef Tips if you’d rather make these in an instant pot. Luckily I had a package of sliced mushrooms that needed to be used, otherwise these Slow Cooker Beef Sirloin Tips would not have turned out as good as they did. I basically rummaged around my kitchen searching for ingredients that would compliment the beef without overpowering it. I ended up with the mushrooms, a half an onion, and some beef broth. I threw it all into a slow cooker with cooking sherry, cornstarch, and some seasonings and set it to low. 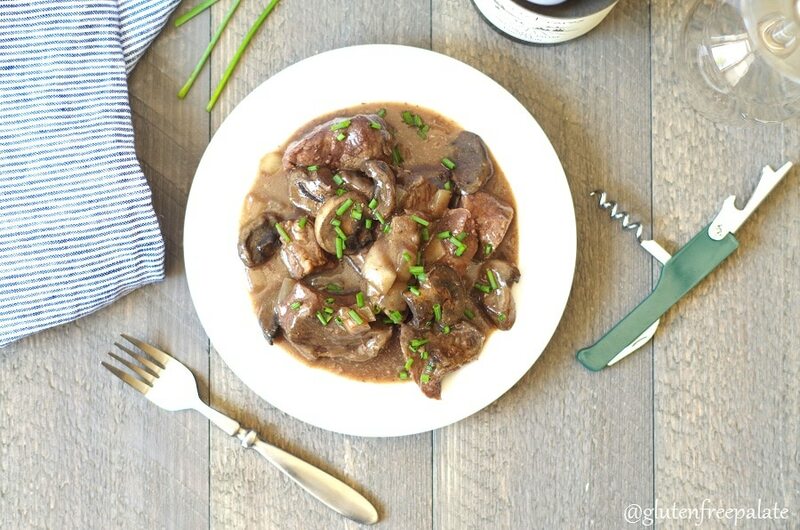 Place beef sirloin tips, sliced mushrooms, and chopped onions in a slow cooker or Crockpot. Mix remaining ingredients and add to the slow cooker. Cook on low for 3-4 hours until done. It’s basically a dump everything in your Crockpot beef tips recipe. Super easy, and comforting especially on busy night. What kind of meat is used to make beef tips? Most people use stew meat. I do like to use stew meat but I find it to be less tender. My preference when making slow cooker beef tips is to use sirlion tips. 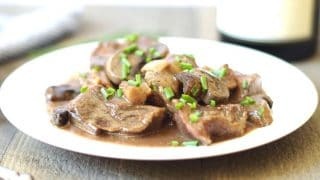 Can I use frozen beef to make slow cooker beef tips? Yes, you can use frozen beef or fresh meat in this crockpot beef tip recipe. It stews long enough that it doesn’t impact the recipe and the beef will still cook through. I could have eaten just the beef sirloin tips and mushrooms for dinner, but my kids needed something with it. I served up mashed sweet potatoes and leftover steamed broccoli to round out the meal when we made these. You can serve it up with your favorite sides. I have grand plans to eat the leftover Slow Cooker Beef Sirloin Tips over the sweet potatoes for lunch. If you like this recipe, you will most definitely love my Savory Beef Short Ribs. They are my favorite short ribs and they are fall-apart-tender. 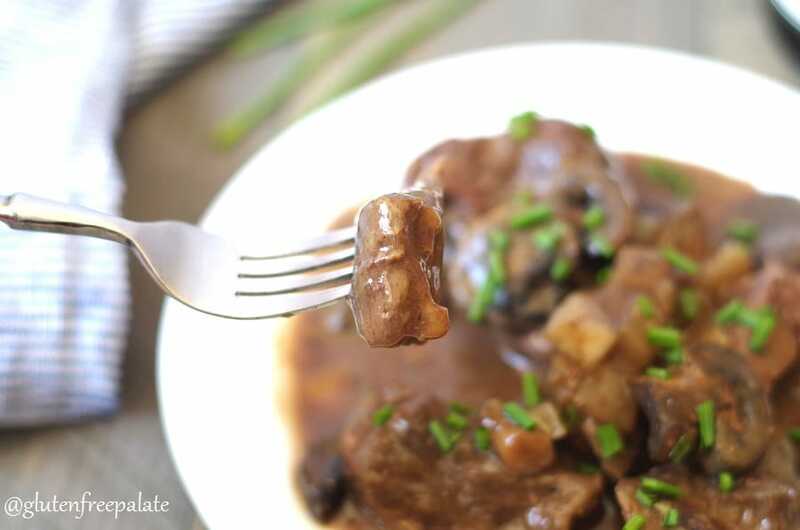 Or, if you’re looking for another beef slow cooker meal, you should check out this yummy Healthy Slow Cooker Beef Burgundy from Katie over at Healthy Season Recipes. If you make these slow cooker beef tips please stop back by and let me know what you thought. 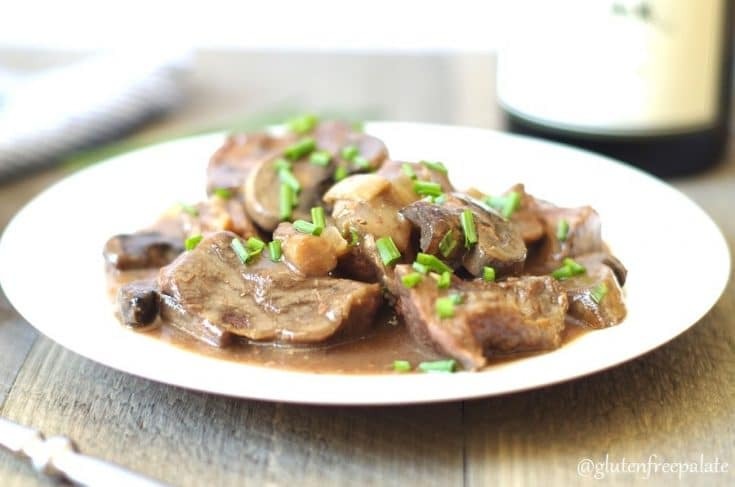 Savory, full of flavor, and super easy to prepare, this Slow Cooker Beef Tip recipe is naturally gluten-free, dairy-free, and Paleo friendly. You are going to love these easy crockpot beef tips. 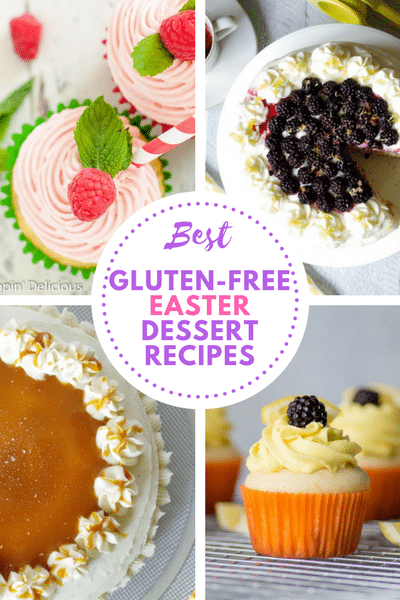 « Gluten-Free Heritage Loaf for the Win! What a hearty dish! 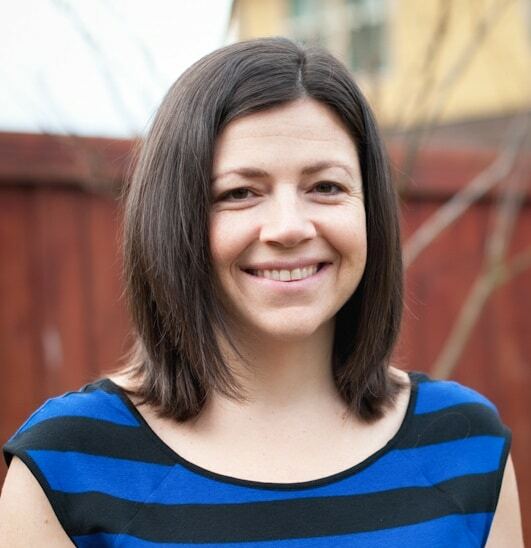 I just love using my slow cooker in the winter for cozy meals! I sometimes forget I have one. I need to use it more. That sounds like the perfect snowed in meal! I wonder if I would be able to make a non slow cooker version of this. The slow cooker always comes in handy. Looks like it pumped out this tasty dinner super easily! Thank you 🙂 I need to use mine more. It really does sound so easy! I’m a big fan of mushrooms in anything. 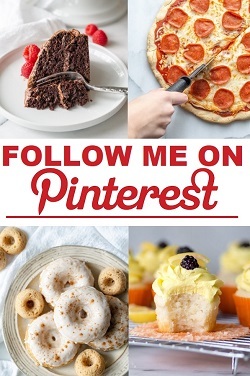 I’ve got a busy month, I need recipe like this! My husband would absolutely love this dinner! It looks so rich and comforting. And you’ll love it because it’s so easy to make 😉 Thank you for stopping by! My husband would really love this dinner. Thank you so much for sharing! Thank you for stopping by Lindsey!